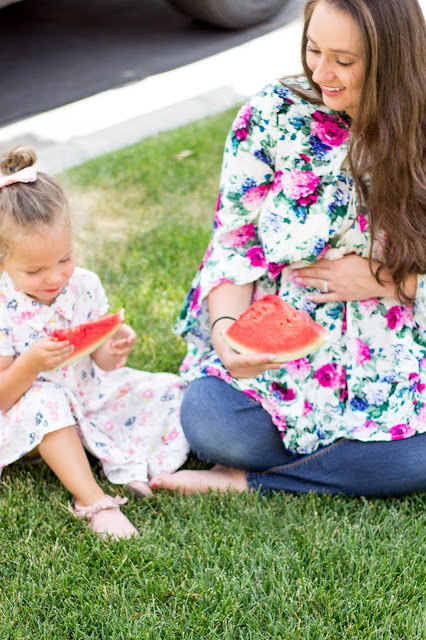 A Little Pregnancy Update | For the Joy of Life. So, I'm 35 weeks and some change. This child is coming in like 4.5 weeks. I'm honestly so shocked at how fast this pregnancy flew by! I also have been seriously terrible with pregnancy updates. How Far Along? 35.5 weeks! Maternity Clothes? YES! 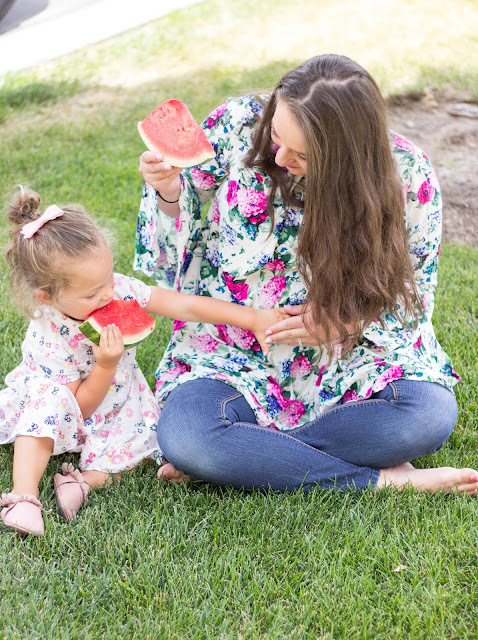 I bought a few pairs of maternity jeans when I was pregnant with Oaklyn and called it good. Not only did I hardly show, but I was pregnant in the winter time and it was so easy dress the bump. This time however, ugh... I hate getting dressed. It's hot. Like really hot. So, I don't really want to wear anything tight. I've been living in dresses but I also got some shirts from Pink Blush Maternity that I absolutely love! 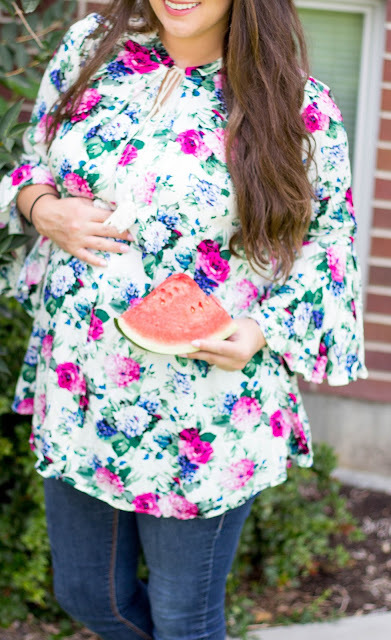 You guys, they actually have CUTE maternity clothes! 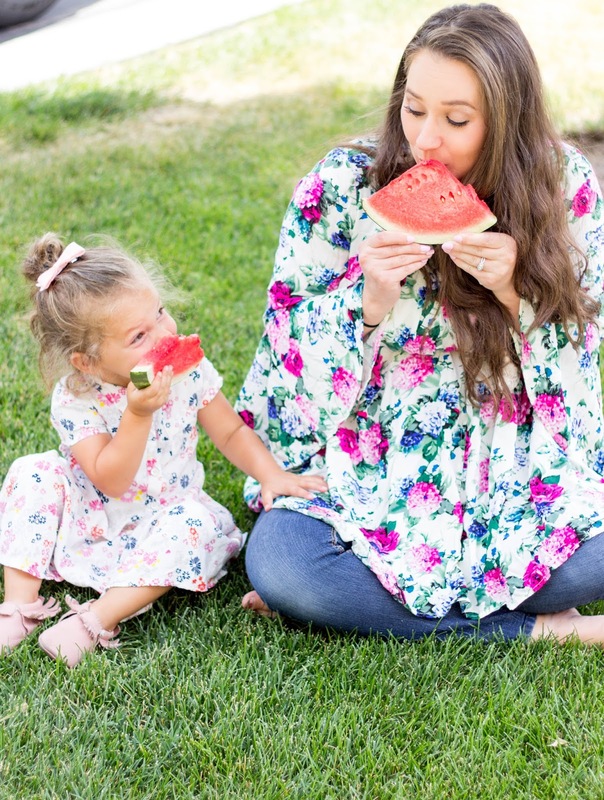 I chose some flowy tops that I love and the one I'm wearing in this picture can be worn after my pregnancy too. If all goes as planned, this won't be my last pregnancy so I figure stocking up on maternity clothes isn't such a bad thing! Sleep? No, not really. I'm waking up more at night to pee which is the most annoying but I'm also switching positions constantly. For some reason I end up flat on my back while sleeping so I've been trying to correct that. Best moment this week? I am pretty nervous to add another little one to our family. Weird pregnancy moment? Just the way this child kicks and moves is weird. She's super active and her kicks actually hurt! Movement: Oh, spoke too soon ;) But seriously, this little girl's movements are so crazy that I wake up from them. She's either really big, really strong, or really crazy haha. Anything making you queasy? Smells are still getting the best of me. Weirdly, I can't stand the smell right after Hunter brushes his teeth haha. Gender: Little girly pie! We'll see if this one has hair like oaks! Best Advice Learned So Far: Bodies are amazing and can do hard things. My body won't always look like this, my body can and will carry this child, and even though labor is scary to me... my body can do it! Well that's all I have this time. This pregnancy is a million and a half times different than mine with Oaks but I guess they'll all be a bit different. I had an appointment today and baby girl is measuring at 5.5 pounds! No dilation but I didn't dilate til about 38 weeks with oaklyn and even then I was just at a one.